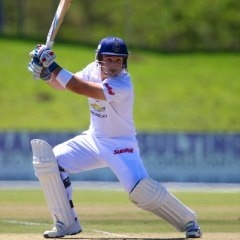 Benoni - Dean Elgar, with an unbeaten 159, batted the Titans towards safety as the Cape Cobras bowlers were thwarted on a rain-shortened third day of Sunfoil Series action at Willowmoore Park. Less than 70 overs were possible on the day due to an afternoon rain shower, and Elgar batted through all of them to carry the Titans to 282 for two. While the hosts still trail by 202 runs on first innings and will need to bat out at least two of the final three sessions, Elgar’s enterprising knock has at least seen them halfway to the draw. He began the day unbeaten on nine, and the most impressive aspect of his innings was how aggressive he was willing to be under the circumstances. Rather than simply batting time, Elgar hit regular boundaries and took just 132 balls to reach his second successive century - a landmark that arrived towards the end of an extended first session. He was ably supported by Henry Davids, who slipped into the anchor role to score 52 from 140 balls, and Theunis de Bruyn, who was unbeaten on 54 when rain stopped play shortly after tea. The Cobras used no fewer than eight bowlers in their attempts to find more regular breakthroughs, but Robin Peterson was the only wicket-taker on the day as he had Davids caught behind by wicketkeeper Dane Vilas. That ended a 173-run stand for the second wicket between Elgar and Davids, but the Cobras’ frustrations continued as Elgar went on to add an unbroken 93 with De Bruyn.